The Invoice Machine is a time tracking, invoice, and billing application offering a basic set of tools for managing your business’ service and product transactions. By basic I don’t mean that Invoice Machine is inadequate, only that it’s not deep enough nor does it offer the breadth of features you’ll find in applications such as Ballpark ( ), FreshBooks, and Less Accounting. What The Invoice Machine does offer is integration with Basecamp, support for Paypal payments and recurring invoices, and a project timer that’s easy to access using your iPhone or iPod touch. Like all of its peers, The Invoice Machine offers a multi-level pricing structure that gives you something extra with every step you climb. In terms of features offered there’s no difference between a Small free account and the $48 Extra Large account. The only differences between the pricing packages are the number of individual users who can have access to the app and the number of invoices you can send to clients each month. Small accounts allow you to send three invoices per month and are available to one user. Medium accounts are $12 per month, give two users access to the account, and allow you to send out up to 30 invoices. Large accounts are $24 per month and give you 10 users and 300 invoices. The Extra Large accounts let up to 20 people access your account and you can send out up to 3000 invoices per month. The Invoice Machine uses five tabs to help you perform your billing tasks. 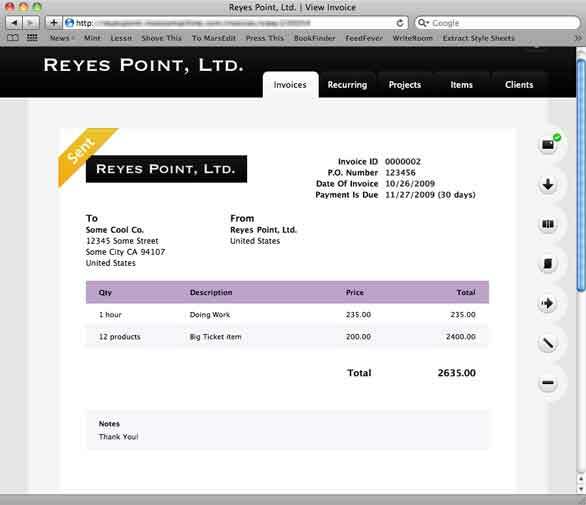 The Invoice tab is where you create invoices. The Recurring tab (which should be a part of the Invoices tab) is where you create invoices that you want to be billed regular schedule and sent automatically. The Projects tab is for creating the projects you use for time billing. The Items tab is where you create and manage the items you sell. Finally, the Clients tab is for recording the people and companies with which you do business. If you want to integrate Basecamp into your billing process—Basecamp integration lets you access all your Basecamp projects, time entries, companies, and people from within The Invoice Machine—or to accept PayPal payments, or customize your invoices and email messages, you do that using the program’s Settings page. What’s missing from The Invoice Machine is depth. You can’t send proposals or manage inventory, there are no reporting features, although you can export your invoice, item, project, and client information, but there’s nothing even remotely resembling a balance sheet and the software’s accounts receivable is nothing more than a webpage displaying the status of invoices you’ve sent. In other words, what The Invoice Machine offers you is essentially a really pretty front end on a very basic spreadsheed-like backend. It isn’t terrible, but it’s not really the best bang you can get for your web-based accounting buck. And, excepting the fact that The Invoice Machine gives you its full suite of features no matter which package you pick, for just a few more bucks a month you can get far more powerful accounting features from other applications. The Invoice Machine offers a very basic toolset, but only puts minimal limitations on users with basic accounts. Simple to manage and easy to use, The Invoice Machine is a good web application for very small businesses, especially if you need Basecamp integration or if your business is small enough to take advantage of The Invoice Machine’s basic account offerings. But The Invoice Machine is missing some very basic reporting features that are requirements for even the most basic of accounting applications. Sure, you can work around some of these shortcomings if you’re handy with a spreadsheet, but if you’re going to spend money on a web-based invoicing app you’d be better served looking at some other options.